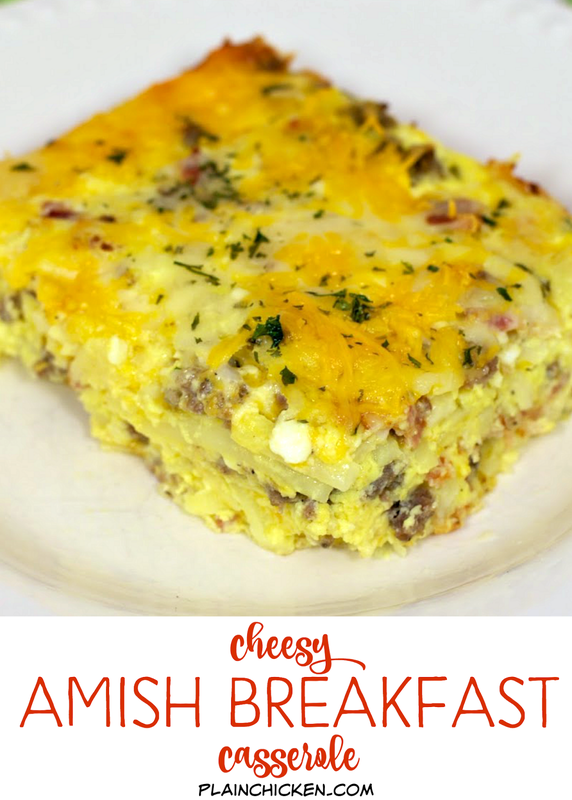 Cheesy Amish Breakfast Casserole - bacon, sausage, hash browns, eggs, cheddar cheese, cottage cheese and swiss cheese. Can make ahead of time and freeze or refrigerate until later. SO good!!! 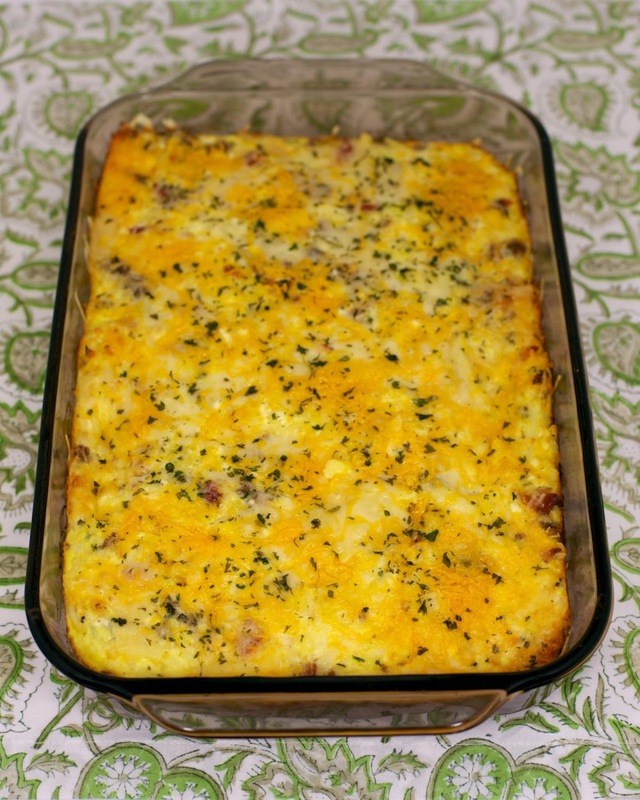 This was one of the best breakfast casseroles we've ever had. It was SOOOO good! How can you go wrong with bacon, sausage and ooey gooey cheesy goodness? I used a combination of bacon and sausage, but feel free to use all bacon or all sausage. You could even add some diced ham or some peppers and/or mushrooms. Feel free to mix it up! We ate this casserole for dinner and leftover for breakfast. It was delicious both times. You can make this ahead of time and keep it in the refrigerator until you are ready to bake it. I also think this would freeze well. Preheat oven to 350ºF. Grease a 9x13-inch baking dish. Set aside. Cook bacon and sausage in a large skillet until done. Drain fat. 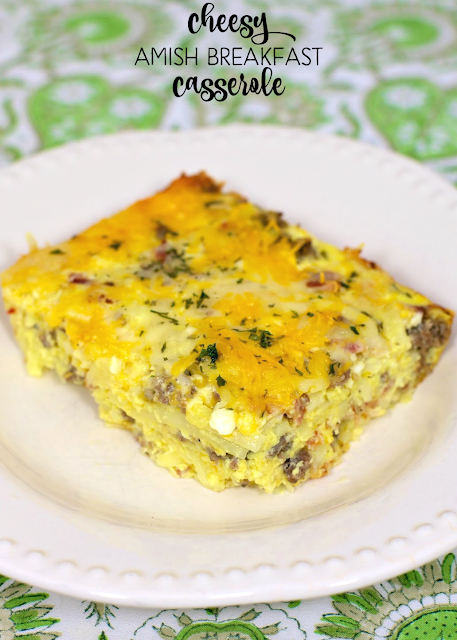 In a large bowl, combine bacon, sausage, potatoes, eggs, cheddar cheese, cottage cheese, and swiss cheese. Pour mixture into prepared baking dish. Bake 40 to 50 minutes. Did you sprinkle cheese on top, or is that just what happens as it bakes? You definitely can't go wrong with bacon, sausage and cheese! AND potatoes? Perfect breakfast. Made this for the first time yesterday morning. Only differences were that I used a lb. of sausage, didn't have any bacon, and used mozzarella instead of swiss for the same reason. My wife, son and I loved it and will definitely make it again, especially when my son's friends stay over, it makes a ton. We will be having at least some of the left overs for breakfast this morning. It was very easy to make, thanks! !